If I were a cobbler and I had kids, they’d be very happy today. Today would be the day I finally gave them shoes! My Portland WiFi site was responsible for some of my first forays into map scripting, but it was dreadfully out of date. Now the site has a brand new look and is more map-centric than it was when it was redesigned six years ago. In fact, when I started the site in 2004, there was no such thing as the Google Maps API. And I’ve given many mapping talks where I go a little bit grandpa on the audience, telling them how hard it was to translate addresses to latitude and longitude points (geocode) in those days. 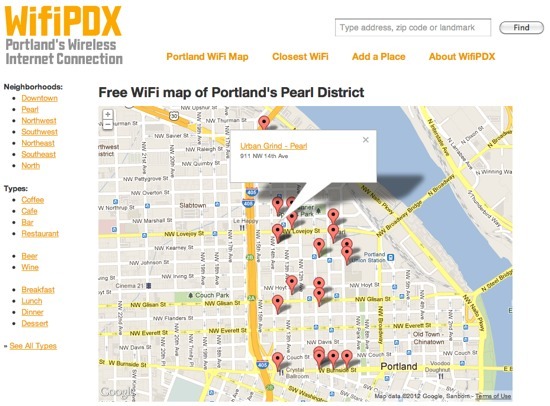 The WifiPDX of 2005-2011 was showing its age, both technically and visually. In late 2008 I started working on a new version, but writing a mapping book got in the way of creating a mapping site. Finally, last August I decided to pick up the project again. When I look at the progression of the site, I’m really happy with the updates. But, working in fits and starts over the last few months, I had a much longer list of things to do. These weren’t even major features, just ways to polish what’s there. Then I realized I needed to listen to my own advice and release early rather than release ready. There’s plenty more going on, but those are the big ones. I could also do plenty more to it–and perhaps I will. But for now it’s nice to be at a state of completion on my first side project in two years.